IT security concerns of the finance sector - Hamilton, Toronto, Burlington, Stoney Creek, Oakville | Professional Computer Management Inc. The cyber criminal Armada Collective gained notoriety for being the first to utilize distributed denial-of-service (DDoS) attacks. This occurs when multiple systems flood a targeted system to temporarily or completely disrupt service. They evolved the idea further and started to extort Bitcoins from victims who were initially notified of their vulnerability. If they didn’t comply with the ransom demands of the criminals, they would flood their systems until the victim's network would shut down completely. This involved criminals using fake profiles to gather information for social engineering purposes. Fortunately, both Facebook and Twitter began to proactively monitoring for suspicious activity and started notifying users if they had been targeted by the end of 2015. However, you should still have your guard up when someone you don’t know, or even a friend or colleague, starts asking you suspicious questions. 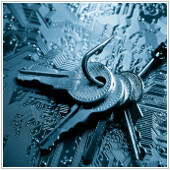 Phishers thrive off familiarity. They send out emails that seem to come from a business or someone that you know asking for credit card/bank account numbers. In 2015, phishers went to the next level and began whaling. This normally involved spoofing executives’ emails (often CEO’s) to dupe the finance departments to transfer large sums of money to fraudulent accounts. POS malware is written to steal customer payment (especially credit card) data from retail checkout systems. They are a type of memory scraper that operates by instantly detecting unencrypted type 2 credit card data and is then sent to the attacker’s computer to be sold on underground sites. GreenDispenser is an ATM-specific malware that infects ATM’s and allows criminals to extract large sums of money while avoiding detection. Recently reverse ATM attacks have also emerged, this is when compromised POS terminals and money mules to reverse transactions after money being withdrawn or sent to another bank account. Dridex, a well known credential-stealing software, is a multifunctional malware package that leverages obfuscated macros in Microsoft Office and extensible markup language files to infect systems. The goal is to infect computers, steal credentials, and obtain money from victims’ bank accounts. It operates primarily as a banking Trojan where it is generally distributed through phishing email messages. Various TTP’s can be combined to extracted data on a bigger scale. Targeting multiple geographies and sectors at once, this method normally involves an organized crime syndicate or someone with a highly sophisticated setup. For example, the group Carbanak primarily targeted financial institutions by infiltrating internal networks and installing software that would drain ATM’s of cash. The creation of defensive measures requires extensive knowledge of the lurking threats and our team of experts is up-to-date on the latest security information. If you have any questions, feel free to contact us to find out more about TTP’s and other weapons in the hacker’s toolbox.